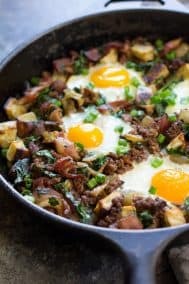 A single serve Paleo breakfast skillet made with just three ingredients plus an egg! 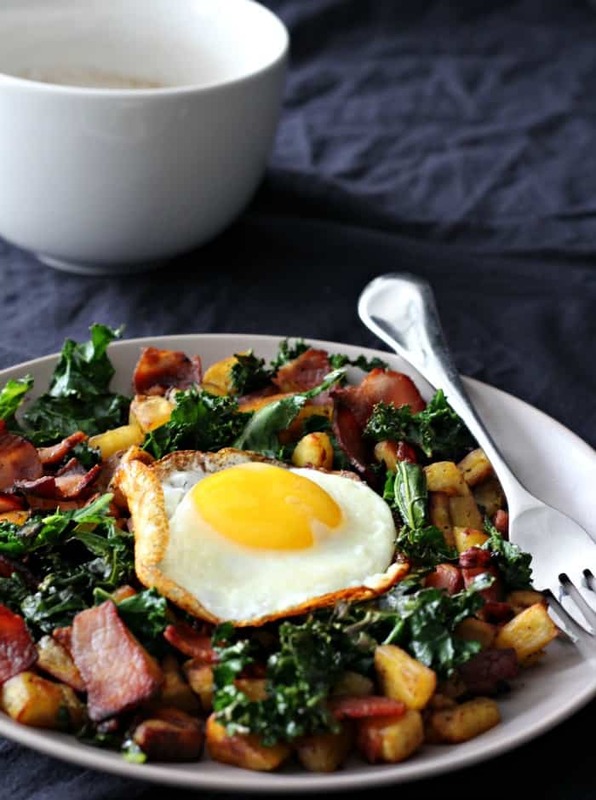 This crispy and savory breakfast skillet with plantain, bacon, and kale is the perfect answer to your savory breakfast craving. Full of crispy savory flavor and packed with nutrients. Grain free, Paleo, dairy free and Whole30 approved. Let’s talk breakfast for a minute – you know by now I love the subject. There was a time, pre-Paleo, when I was all about sweet breakfasts all the way. I used to eat huge bowls of cereal with berries, bananas, honey, and almond milk. Then I’d eat another. Occasionally, I had eggs with toast – and the toast was always cinnamon raisin with butter and honey. The only time I ever ate bacon with breakfast was if I was out to eat and assumed it would make me sick. I did always get sick, but I have a feeling the pancakes with syrup or stack of rye toast might have had something to do with that. Anyway, I remember when I began eating Paleo I thought there was absolutely no way I could eat bacon, sausage, and potatoes in the morning without being sick later on. I actually recall waiting for it to hit and being REALLY surprised when it never did. In fact, after 2 weeks of eating breakfasts like this, it was apparent that I felt better than I ever had in my life – my digestion was improving along with everything else. So, my crazy love for savory breakfasts was born, and has since just grown and grown. Sure, I love my breakfast bread in the afternoon, but, you’ll probably never catch me Instagramming it for my actual breakfast! Sometimes, I have a savory/crispy craving in the morning – especially after a long run – so much so that even plantains and sweet potatoes seem too sweet. After my first long run for Boston training, I wanted something easy (of course), super filling, crispy, and savory. So, I made this recipe! It uses a green plantain – which I typically reserve for chips and fries – but wanted to see what would happen if I let them hang with sizzling bacon in a pan for a little bit. Well, wonderful things happened! The bacon and plantains got nice and crisp, and I added kale for more crispiness and nutrients, too. A crispy fried egg completed this single serve paleo breakfast skillet in the best way possible! This recipe can easily be adapted to serve more than one by simply doubling the ingredients and using a bigger skillet. See? Everyone is happy! 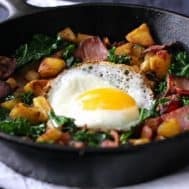 Quick and easy 3 ingredient single serve Paleo breakfast skillet with savory and crispy bacon, plantains, and kale, plus an egg! Whole30, grain and dairy free. *To peel a green plantain, you'll have to score the sides and separate the peel from the plantain with your thumb or a knife. You'll use half a large one for this recipe. Chop the peeled plantain into small thin pieces. They'll crisp up better when on the thinner side, although it's not incredibly important. In a small - medium heavy skillet over medium heat, add the bacon pieces and stir to evenly cook. When the bacon begins to render fat, add the chopped plantain and stir for even cooking. Cover the pan (the lid doesn't have to fit exactly) and allow the bacon and plantain to cook together, removing the lid to stir after about 30-60 seconds to prevent burning. 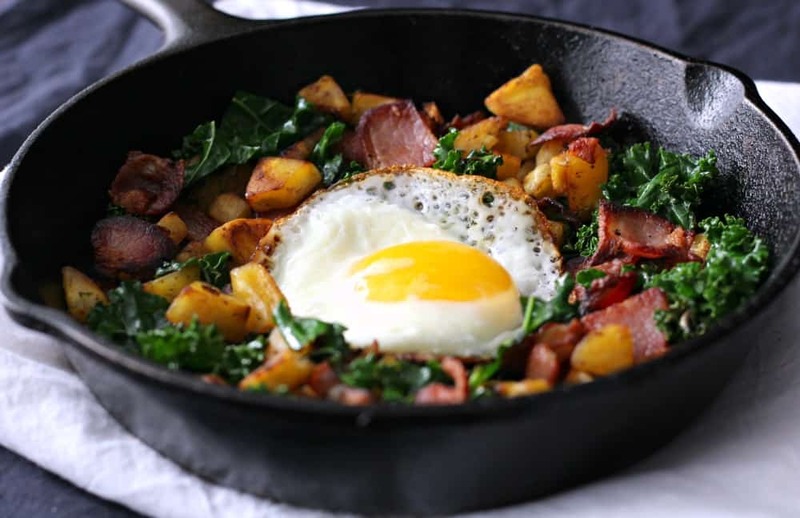 Once the plantain and bacon begin to brown, add the chopped kale to the skillet, stir, and cover again with the lid, adjusting or lowering the heat to prevent burning if necessary. Once your egg is cooked, put the hash on a plate and top with your cooked egg. Enjoy! **U.S. Wellness Meats sugar free pork bacon is seriously incredible and has been my go-to favorite bacon for years! I wish that trader joes sold plantains! I love these kinds of breakfasts, especially after a long run. It’s rare that I crave a sweet breakfast but I do enjoy eating something savory with a side of bread or fruit. Funny that I don’t want fruit in the morning but always at night! The green ones are completely different and they make amazing chips! Super crispy. It looks so good! I am all about egg casseroles after early morning runs. They are nutritious and satisfying and keep my brain alert and my body satisfied for many hours. I remember the time when I was fueling my runs with cereals and after a bowl I would crave another one, and another one… At the time I thought it was normal to be hungry all day after running! Not true : it’s important to feed our body optimal fuel! Thanks for sharing this recipe! Yup that’s how I used to be – hungry, tired and a lot of stomach problems on top of it! Numanum. I’m loving plantains + eggs + chicken sausage + kale lately (should give bacon a go, I don’t know why I don’t ever buy it!). It’s been my go too. 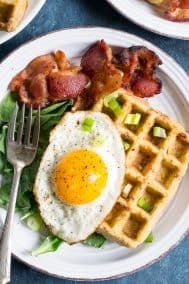 I’m with you on starting a paleo approach – I was so used to either oatmeal or yogurt than swapping to savory AND more food volume was a transition but I’m so glad I did it. Plus, I’m now in love with the savory breakfast! Sausage and chicken sausage are great too and definitely in my rotation! Bacon is easy to get into as well and since it renders fat you don’t have to add any. I love savory breakfasts like this! There isn’t a morning I don’t have my eggs. How do you peel your green plantains? I find there’s always a bear to get out if they’re not ripe. I cut the ends off, score the sides and sort of get under the peel with my finger and it comes off really easily as long as the plantain isn’t bruised! This looks amazing! I actually prefer fruit in the morning but I know it’s better to have veggies so I’m working on that! Omelettes any time of day in my opinion! They actually feel more special when it’s not breakfast. I occasionally want to make a good gf oatmeal and then never wind up doing it – need to change that once in a while! 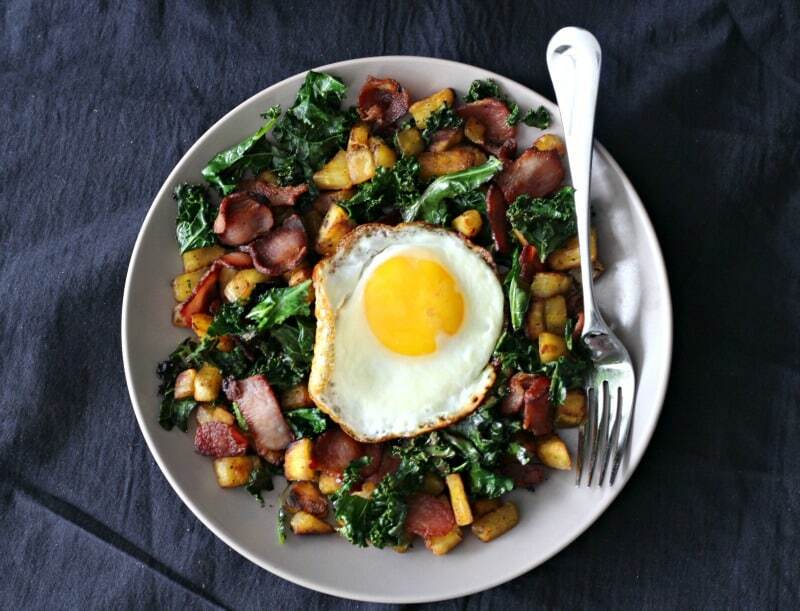 I am savory breakfast and hash obsessed although I really don’t eat very much bacon. Mainly because the good stuff is expensive and the other stuff I could take or leave it. 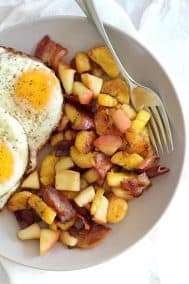 I used to eat oatmeal like it was my day job and in high school it was cereal, but now I do a hash very similar to this every single morning no matter what! I ate Life cereal every single day until I was diagnosed with celiac 8 years ago. Then it was a lot of GF oatmeal and rice chex. Now I’m taking a page out of your book! Feeling like a grown-up with the ultra-savory breakfasts-ha! Life cereal is good stuff, I loved it for so long 🙂 So funny that it makes you feel like a grown up! After a long run, I love a savory course like this followed by a sweet treat like an apple and sunflower seed butter and Enjoy Life chocolate chips. I need both in my breakfast life! I don’t like bacon at all – but otherwise this dish sounds delicious! I go through phases for breakfast between wanting my oats and wanting my egg & veggies! I love your breakfasts! I just never have time or energy to make them in the morning. I usually grab a chocolate chip cookie and a coffee, and then I’ll make something savoury later on at like 10 or 11am! Your eggs are the most prettiest eggs EVER. That’s like Adam – except he doesn’t make himself later on and actually I have no idea what he eats during the day! I hear you though that it can feel like a lot to cook things in the morning during the rush. I can’t do savoury breakfasts, but I sometimes like to grab a savoury snack around 9 or 10 am. Like right now I’m munching on carrots with salsa and hummus 😆 But I’ve always been a sweet breakfast kind of girl… it just changes between oatmeal, smoothies, fruit, cereal, etc. I never think to snack on carrots with dip but that sounds yummy – especially with salsa! Such gorgeous photographs! Yeah, I usually do cereal or toast for breakfast, or sometimes a smoothie, but I’ve also been trying to get more veggies in of late. I have a ton of potatoes in the fridge, so I might try this with potato in place of the plantain. Looks delicious! Thank you 🙂 This would be great with any type of potato – you’ll likely have to keep the pan covered for longer though to make sure they get nice and soft before crisping up. I make a variation on this with Japanese sweet potatoes that’s so good – experiment! 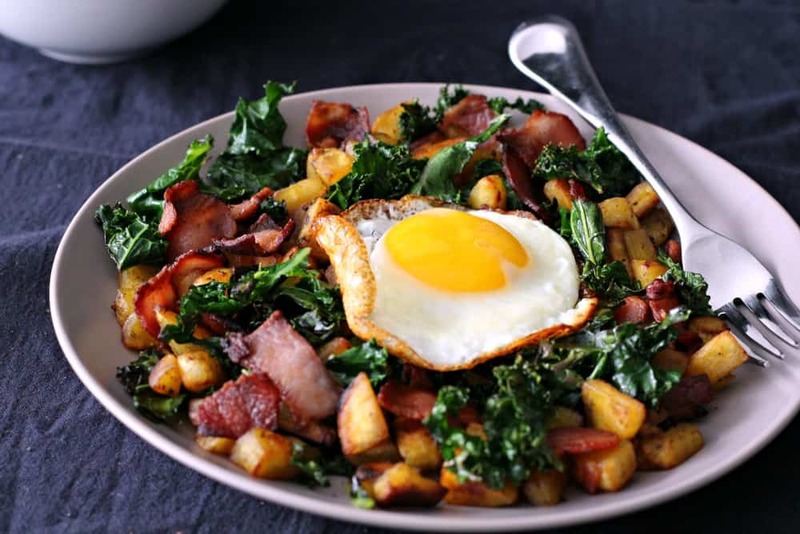 I eat kale with two fried eggs, all cooked in bacon fat almost every morning…my kids have even started asking for “eggs sunny side up” which makes me laugh as we have come so far from “scrambled and covered in cheese” since starting Paleo!!! But I do try to force myself to eat more savory breakfasts, and this looks delish! Savory is sooooo much better for you than sweet. I just have a hard time with it! I always do enjoy it when I have a savory one. I used to be a “serial” cereal eater. Every single (weekday) morning. CEREAL!!!! I still love it, but only have it about one or 2 times a week :/ What I WISH they made GF and what not is Cap’n Crunch! I don’t care how bad that is…I would devour every single box! I can’t have too sweet for breakfast most days, but I love oats made with water, a dash of sea salt, and just a bit of blackstrap molasses. But on weekends I always want eggs, bacon, and toast! And after long runs I need salty. Funny how we get those same cravings after long runs – it’s the only way to go for me! I like how you describe everything being crispy! That’s definitely the best kind of breakfast. My quick breakfasts include Applegate sausage and some fruit. They serve a purpose on busy days! I saw this on FB earlier and almost madeit for breakfast! Alas, no plantains. Next week it’s going on the list! You’ll love it – nothing not to love! This looks exactly like what Dave has been eating minus the green plantains. i think he will love that addition, can’t wait to have him try this!! Ahh yes, they fry up really well with bacon! This looks perfect like most (read:all ) your breakfast dishes 🙂 you really make me want to try plantain but it’s sooo rare here! I’m looking for it today again but I don’t have high hopes. Thank you! I am definitely lucky to have a supply in most local stores here, although quality matters and only a couple of stores have really good ones regularly. This looks soooo good! How can you ever go wrong with plantains and bacon?! This looks delicious! I love cooking in my cast iron skillet! In college I used to eat a lot of bagels, muffins, anything easy to eat on the go which worked for me back then but now I can’t go a day with a green smoothie for breakfast! My body just craves it just like it used to crave blueberry muffins back in college! Hi Michele! I can’t seem to find plantains here (I live in Melbourne). I was wondering if you had anything else that you would recommend in place of the plantains? Thanks in advance! I bought everything to make this recipe (minus the kale, ugh how did I forget the kale?!?) and made it this morning. I researched fried plantain recipes first, and decided to try a suggestion I read in the comments. Cut off the ends of the plantain and then microwave the entire fruit for two minutes on height, flip to the other side and the nuke for two more minutes. The plantain peeled super easily and fried up really well. Since I had some leftover butternut squash in the fridge, I steamed them until ‘al dente’ and then finished them with the plantain. Used sugar free turkey bacon. This version of the hash turned out fantastic! Thank you! This is the perfect healthy dish for the breakfast. And egg made this dish more delicious. I like this because I love all the ingredients. I will try this next weekend.